Peter Weller, Nancy Allen, Ronny Cox, Kurtwood Cox. Original large, for outdoors promotion movie poster. Large dots printing billboard style. Size: 45.5 x 60 inches. Condition: near mint and unused. 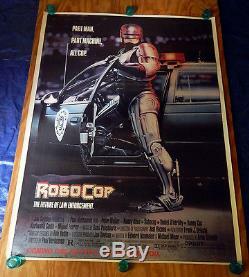 The item "ROBOCOP (1987) ORIGINAL LARGE 45 1/2 X 60 MOVIE POSTER ROLLED RARE" is in sale since Friday, August 18, 2017. This item is in the category "Entertainment Memorabilia\Movie Memorabilia\Posters\Originals-United States\1980-89". The seller is "moviepostercenter" and is located in California.